For a long time now I’ve commuted with a pannier (office) bag and a bar bag. These have worked really well, especially on 18.5 miles commutes verses a rucksack on my back which put too much pressure on my body. The bar bag was a useful place to keep keys and valuables as well as my front light battery pack. I also didn’t like a sweaty-rucksack-back on hot days. I see a lot of commuters with rucksacks and my bags are starting to show their age, so I decided to try a rucksack for a week before investing in new ones. My commute for some time has been a lot less than when I started with this setup, but I kept the same setup. Currently my commute is only 12.5 miles and the weather was hot, so it felt like a good time to try. One day I might even fit the drop bars that my first Thorn Raven came with, but there’s other maintenance I need to do on here at some point before then. In all my years of cycling I’ve whimped out at the thought of clipless pedals (a.k.a. clip-in pedals). The price of them and shoes seemed to be putting me off too. 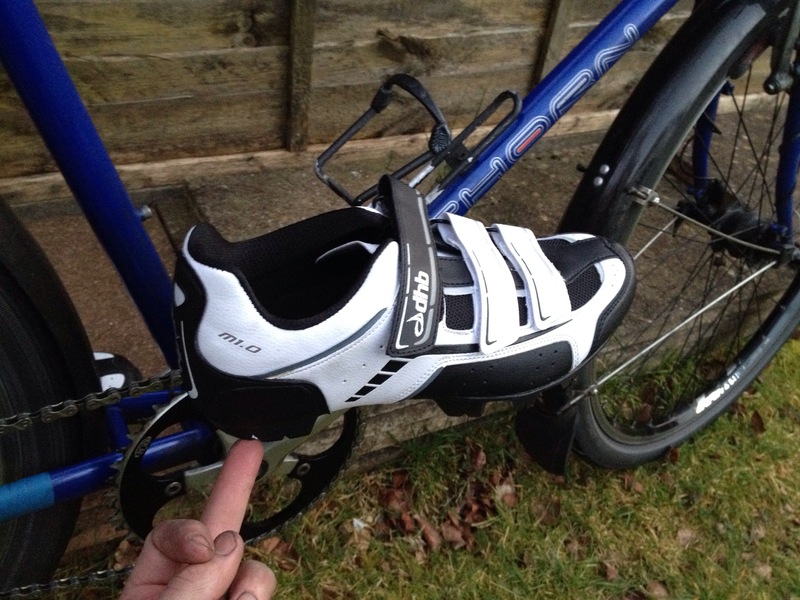 But it turns out there are cheap ones available and £60 will buy you shoes, SPD (Shimano) cleats and pedals. Before Christmas I purchased the shoes and cleats with a view of fitting to my single sided touring pedals that I’ve had in stock since I bought a bike several years back, that didn’t happen. Then I acquired some double sided SPD pedals from my brother, so I then had a couple of options that didn’t happen. I cleaned bluebell before swapping winter tyres for normal ones (she was pretty dirty and it’s a good idea to clean a bike before swapping tyres because you can then store the clean tyres). I degreased my chain and tightened up the eccentric bottom bracket. 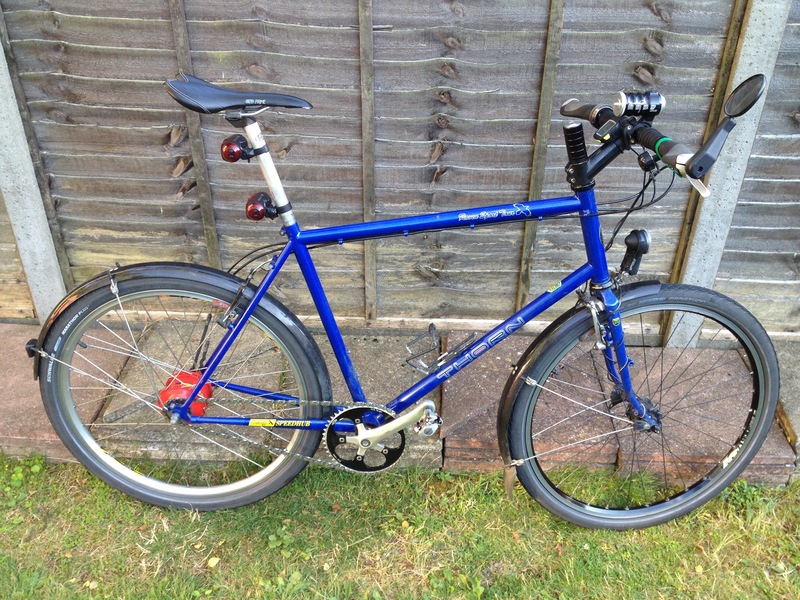 I fitted new brake blocks. 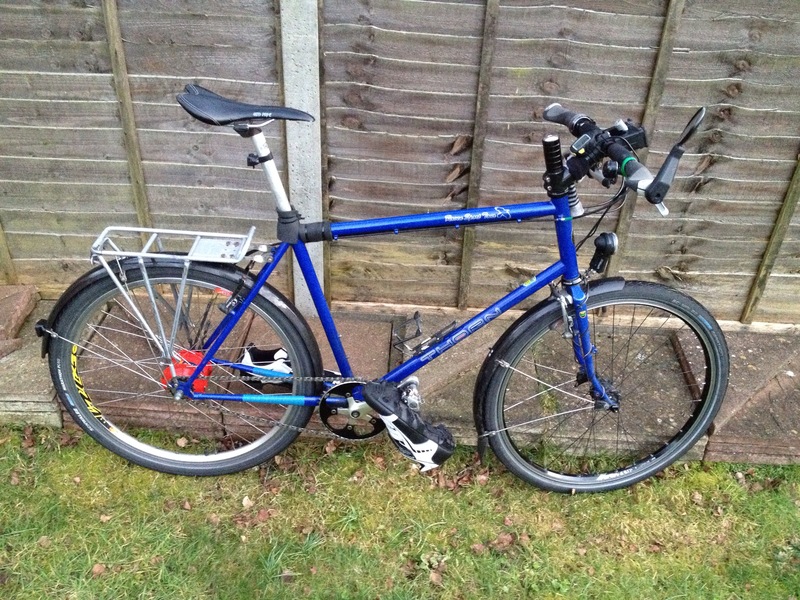 Then, I got carried away and in a fit of madness I fitted the pedals and put on my new shoes, cleats as loose as possible… Test ride around the garden… I don’t know what I was scared about! These Shimano SH56 cleats allow easy sideways slide, twist or angled disengagement (I said it, it must be correct). The SH51 cleats are not for me and scare me, they are not for a learner like me. Since the cleats are cheap I may one day switch to them, but I can’t see why I would. Other brands may be better or worse, I just went for what’s cheap and popular. First and probably last video! The birds in my back garden were mocking / heckling me. Don’t fear cleats, just get easy release ones and setup the pedals for easy release. I rode to work and back without falling off too, so can you! I’ve had this before when I’ve over tightened the eccentric bottom bracket, so I loosened that up a bit and tried another test ride. The grinding noise was still there under power / high tension on the chain. The Rohloff sprocket is normally reversible (13T is the exception I think), so I took the beast (Park Chain Whip) and whipped it off, flipped it over and the problem is solved.